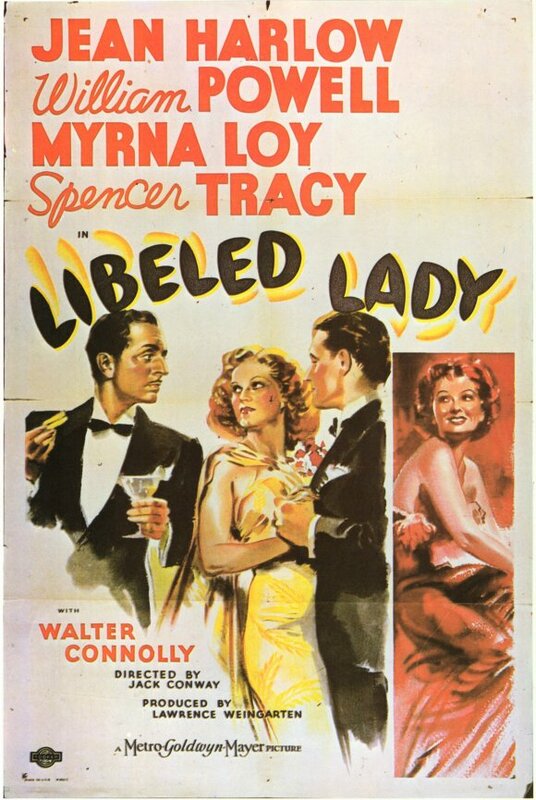 Nominated for a Best Picture Oscar, “Libeled Lady” moves at a quick pace barely giving the viewer time to catch one’s breath. Directed by MGM house director, Jack Conway, Loy is Connie Allenbury, an heiress who is suing a local newspaper for five million dollars for printing false accusations about her stealing another woman’s husband. The paper’s editor is the scheming, crusty Haggerty (Spencer Tracy) who plans to obstruct the lawsuit by creating a scheme that will make Connie appear to be a real husband stealer. His plan is to enlist the services of Bill Chandler (William Powell), a former reporter for the paper, along with his own frustrated fiancé of two years, a reluctant Gladys (Jean Harlow). Haggerty convinces both Bill and Gladys to get married to each other, but only for appearances sake, and not certainly not to be consummated! Bill will then “seduce” Connie, who is unaware that he is a married man, into a romantic relationship only to have Gladys come barging in causing a public scandal with Tracy’s paper breaking the news, forcing Connie to drop the suit. A fishing scene is also a highlight with Bill pretending to be an expert on trout fishing to impress Connie’s father, a delightful Walter Connelly. He unnervingly finds himself in the stream soak and wet, yet somehow managing to bag the largest catch of the day (This whole sequence reminded me of Howard Hawk’s 1964 comedy, “Man’s Favorite Sport” where Rock Hudson passes himself off as an expert on fishing but has actually never fished). As the film progresses, the plot becomes thicker and wilder, with Gladys beginning to believe she is really falling in love with Bill, while Bill actually falls in love with his supposed mark, Connie, and the two impetuously getting married. A jealous Gladys will accuse them of arson when she really means bigamy. Marriage of convenience has been a common plot device in many comedies over the years, “Hired Wife,” “Come Live With Me,” “The Lady is Willing,” “Next Time I Marry,” and “The Doctor Takes a Wife” are a few films that have used the same theme. I actually watched the last of these film’s mentioned recently, a pleasant entertaining movie with Loretta Young and Ray Milland, though not in the same league as “Libeled Lady.” If “Libeled Lady” has a flaw it comes in the final minutes when all that is going on in the convoluted plot needs to be sorted out to ensure a happy ending, particularly the problem of Powell’s character who married Harlow during the course of the movie, but is in love with, and marries Loy, making Powell a bigamist. Well, we can’t have that, after all, this is 1936 and the production code is in effect, so as the film comes to its conclusion, Bill announces he looked into Gladys’ past and found that her Yucatan divorce from her first husband was illegal, subsequently, she was not free to have married him, making it legal for Bill to have married Connie. 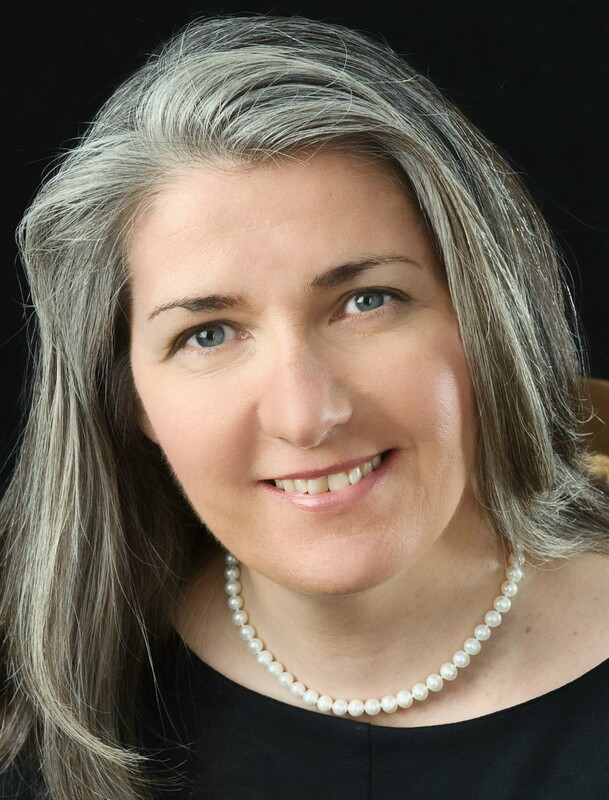 Only the put upon Gladys has her day, coming back with an unexpected topper, by announcing to everyone she followed the fiasco Yucantan divorce with a legal Reno divorce, freeing her to have married Bill! Unfortunately, both of these plot points come out of nowhere, like a mystery writer who injects a totally unexpected twist, an unseen and contrived idea into the storyline in the last chapter, with no previous hint earlier in the story, to surprise the reader. The entire scene is too manufactured and feels forced in order to resolve Bill’s double marriage dilemma. That said, this is a not to be missed fun filled farce with a spectacular MGM cast. Myrna Loy who can express witty and naughty looks by just the raise of an eyebrow is matched flawlessly against her ideal screen partner, William Powell. Jean Harlow is a comedic gem with the right touches of cunning and naiveté, and Spencer Tracy is perfect as the calculating newspaper editor who puts the paper above all else. 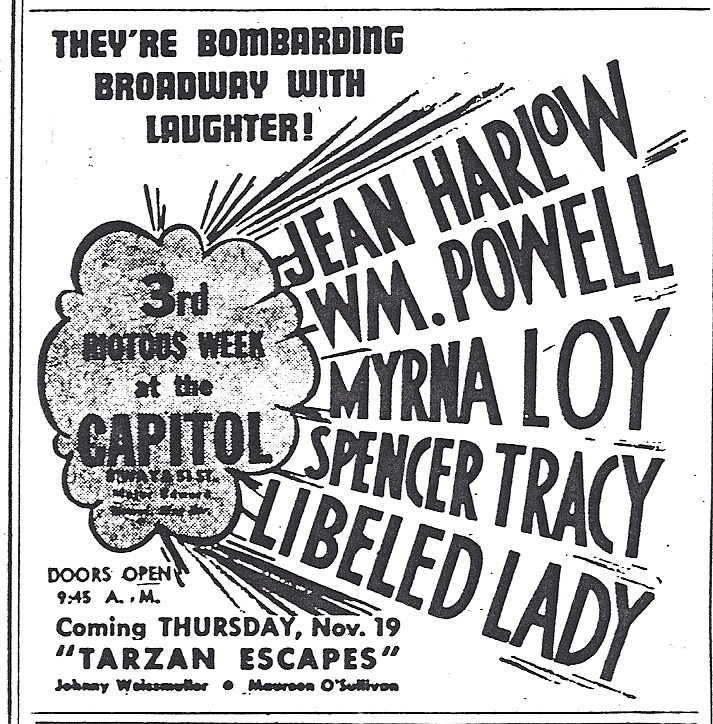 This entry was posted in 1930's, Film Reviews, Jack Conway, Jean Harlow, Loretta Young, Myrna Loy, Spencer Tracy, William Powell and tagged Jack Conway, Jean Harlow, Libeled Lady, Myrna Loy, Spencer Tracy, Walter Connelly, William Powell. 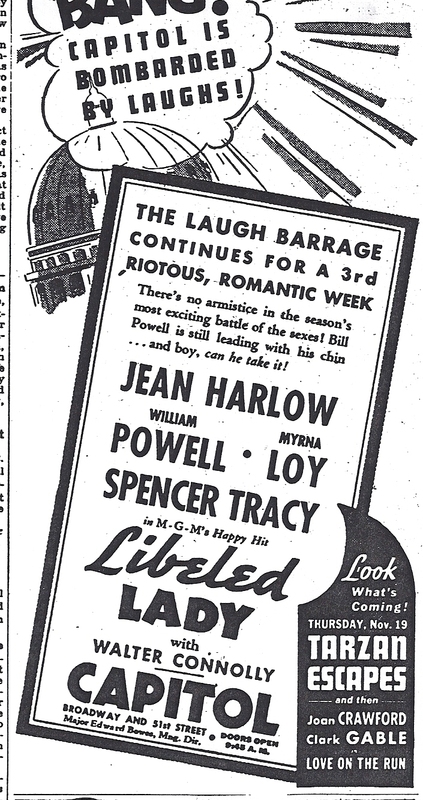 A brilliant comedy, part of Powell’s magnificent 1936, arguably the best calendar year any film actor has ever had: “Libeled Lady,” “The Great Ziegfeld” (best picture winner), “My Man Godfrey” (nominator for best actor), “After The Thin Man” and “The Ex-Mrs. Bradford.” Leading ladies included Loy, Harlow, Carole Lombard and Jean Arthur. Pretty damn good year, doncha think? With those four fantastic leading ladies how could it be any better? I have not seen THE GREAT ZIEFELD but other films are all terrific. This was a nice review of one of the better comedies if not my favorite of 1936. It’s funny that you mentioned “Man’s Favorite Sport” since I thought of the same scene with Rock. Although a campy one, I really got a kick out of him in it. Very nice review, capturing the films high points. Enjoy your holiday weekend. Well, I agree it is hard to top THE THIN MAN films they may arguably be the best of all the husband/wife detective films out there. I always enjoyed MAN’S FAVORITE SPORT. Paula Prentiss was a great comedic actress but never given the right role to propel her to the forefront. Enjoy your holiday weekend too! This is one of my favirite MGM screwballs, if not the best. Four leads are awesome, and as a fan of William Powell, I enjoyed his solid performance here. I haven’t seen it for years, and your review sent me to hunt for the old VHS in my closet (I really have it on a DVD though). As you pointed out, the conclusion is somewhat contrived, but it is full of fun throughout. I vaguely remember about Rock Hudson’s “Man’s Favorite Sport”, but I have never connected it to this film. A great review. The leads are awesome! Everytime I see Powell I have to admit I enjoy him more and more. He and Loy made one of the best teams on celluloid. The four make a dream team. Hope all is well. Interested to see you mention ‘Man’s Favorite Sport’, John, since I’ve just bought the DVD of that one (trying to catch up with the remaining Hawks movies I haven’t seen! ), but haven’t watched it yet. 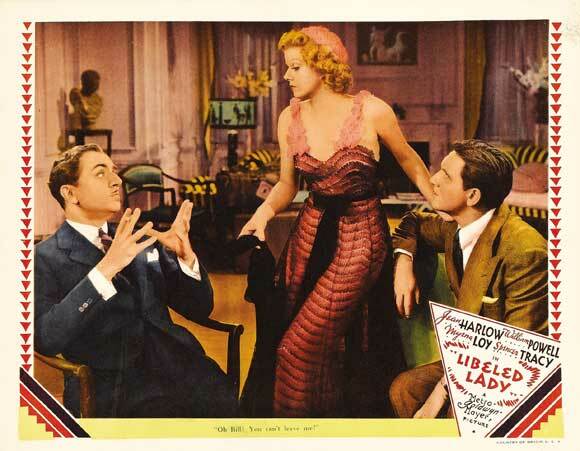 ‘Libeled Lady’ is another one I haven’t seen, but, with its fantastic cast, that is something I want to put right very soon, all the more so after reading your review! 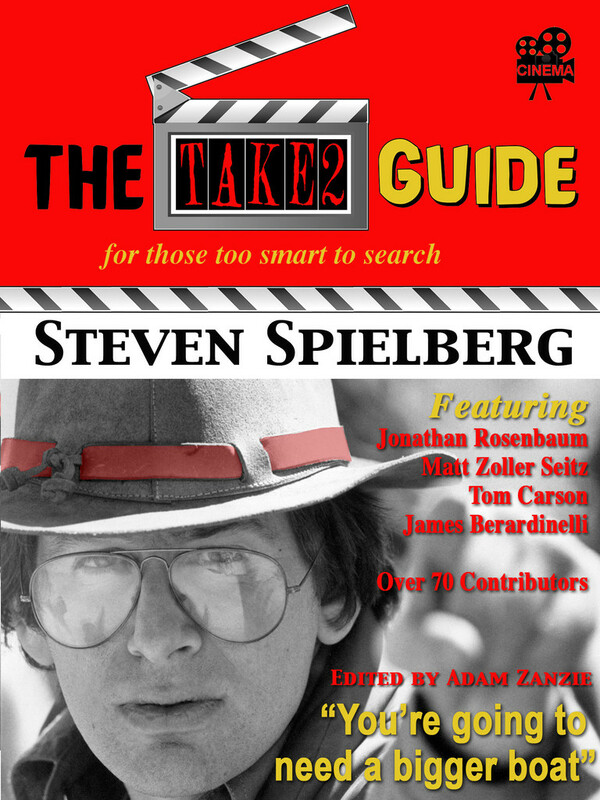 As a fan of 1930’s movies, and with this cast I am sure you will enjoy this one. It is one of the great screwballs. The connection with MAN’S FaVORITE SPORT is only that that Hudson pretends to be a fishing expert which is what Powell does at one point in the film to impress Loy’s father. It is a vague connection but that scene just struck me.